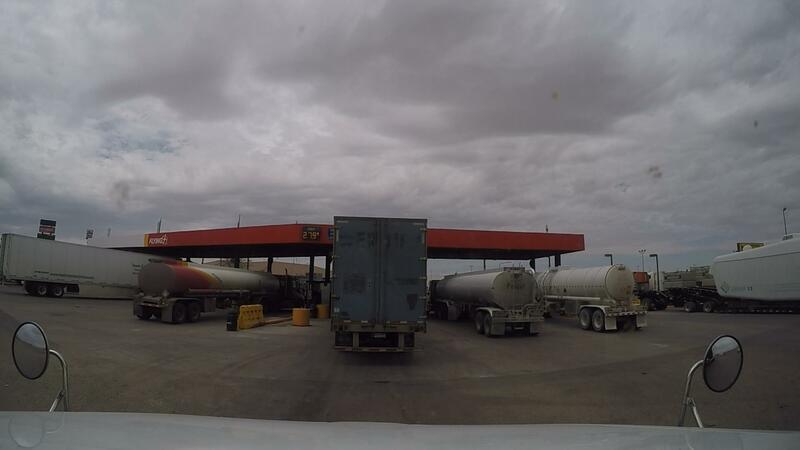 Here are a few general truckstop tips for your visit to truck stops across the country. Add your truck stop tips to the bottom of the page if you have some. You will discover that choosing a truck stop will often depend on your reason for stopping or what you want to do when you stop. The objective is to be efficient. If you need to stop to use the bathroom or take a break, what else do you need to do at a truck stop? It could be cash a check, use the fax machine or take a shower. Stop somewhere that you can get as much done as possible. If you're stopping for your required break, plan to stop where you can take care of other business while on your break. Parking - Park beside a curb if possible. At least that side of the truck will be protected from getting snagged by someone pulling out. You'll usually find these spaces at the back of the parking lot or furthest away from the building because drivers don't want to walk. But they are still the first to go so good luck. lol. And finding a parking space in the truck stop parking lot is the second parking tip for truck stops. Also, practice your backing if you are a new driver. Find that curb or empty space and back in several times. Drivers often ask me for backing tips. The best tip I can give is to practice AND don't be embarrassed to stop and get out as many times as necessary to see where you are and understand how you are doing (placement of trailer as a result of adjustments) oh, and make sure you are not hitting anything of course. Shopping - Don't do your regular shopping at the truck stops if you are trying to save money. The truckstop is basically a convenient store. The prices are higher than average for most items. Which is not abnormal, you always pay for convenience. 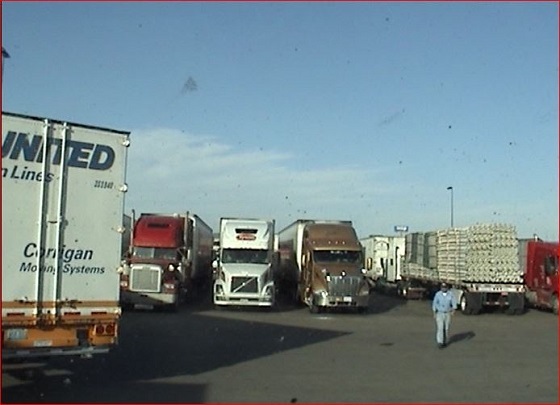 Good truck stops provide a valuable service to the truck driver, most of it for no fee. (In the form of parking) It's not their fault if we don't plan ahead and bring what we need. Plus there is probably a discount store near, if you need to buy a lot of stuff. Whatever you do, don't pay the higher price and then stand in line complaining or talking junk to the truck stop cashiers. Never made sense to me, makes you look silly. Pay the price or just buy supplies and tools for the road somewhere else. Ideally before you leave home. Eating - If you go to the buffet, get your food from the back of the pan. If the buffet is accessible from both sides get your food from the middle of the pan and cross your fingers. (just saying). People are always going up there without washing their hands. Just real talk. Watch for yourself when you are in the bathroom. You don't have to be a trucker to witness this. Also, consider this, we have become accustom to using the buffet in order to pig out. Been there, done that. It's natural to want to get your money's worth. Here is the deal, we stretch our stomach when we stuff ourselves and so it takes more and more to feel full. Which of course means you are able to hold much more food than you are willing to exercise and get rid of. Then you end up with extra belly fat. Meanwhile the older you get and the more you sit the slower your metabolism and higher the digits on the scale. It's best to regulate by having a strategy now. I learned the best strategy is to NOT STUFF YOUR FACE. Studies show that smaller amounts of food consumed at different times is much healthier for our bodies than a large amount at once. Some truckstops are better to stop at for different things. You'll probably find yourself leaning towards a particular type depending on what's important to you. Or actually, it could just depend on what your mood is at the time. Here are some things that determined which truckstop I stopped at. First I will list the intended purpose of stopping then I will list the order of choices from 1st choice to last. The first 3 truck stops on average all have game rooms and tv. Petro may have a little more of each. Still my first choice usually is determined by how much it costs. (update: they all cost the same now!) Make sure you have your laundry detergent with you from home. It's more expensive at truck stops and sometimes they may have some off brand that you don't use. Many truck stops allow you to pay for laundry with credit/debit card now. Of course there are other truck stops that I wash at when I need to these are just the common ones. Something so simple but it tells a lot about the mindset of the people in charge of the truckstop and the franchise I suppose. You notice easily that some truck stops pay more attention to the drivers needs in some areas. My top choice is Flying J because they have they usually have the long windshield washer handles on the brushes and actual washer fluid in the water. In the truckstops defense, they may do more about keeping us with good brushes and fluid if clowns stop trying to wash the whole truck with them. Petro - Close behind the flying J with long handle sometime has fluid in the water. Pilot and Loves almost always have the brushes and wash buckets but not so much fluid in the water and very few have the long handles on the washer brushes. Other truckstops may have wash buckets and brushes and they may not. To me the food at the truckstops is real close among Flying J, T/A, and the Petro. I guess it kind depends on what you like to eat, so you will have to check them out and decide for your self. Its a lot of variations to compare. Different foods in different regions. Drivers complain at each one. To me the food is decent in all of them, then again, I am not all that picky. For Salad I usually go to the Petro they have more stuff to put in the salad. They have more stuff to put in the baked potatoes too. To me and apparently many other truckers the Pilot is the best stop for Coffee. (Saw the result of vote yesterday the picked the pilot for the bet coffee.) One of the main reasons I like the Pilot is because they have those extra caffeine shots that you can add. These work well for me cause if I do stop to get some coffee most of the time I get the frozen coffee and add that shot of caffeine to it. This is not for all drivers cause it can be habit forming. For your down time it depends on what entertains you the most. If I want to play Area 51 a little bit (hey it's a good shoulder workout and hand eye co-ordination exercise) I do the Petro. Some Flying J's have them too but Petro is a safer bet if you want to play video games or watch movies on tv. I will have other truckstop tips when think of them. Have A Great Truckstop Tip? Do you have Truck Stop Tips? If you see truck stops that are trying to make healthy food available to drivers or provide some other benefit to serve drivers let us know. If you have any other truck stop tips feel free to let us know too. dont mess with the working girls also know as commercial company. actually we are planning on building a small truck stop and would like to get opinions on what would make it the best. Flying J exit 188 i-70 Warrenton Mo Lemon lime low calorie Gatorade G2 is on sale for .50 it's in the clearance bin.